Monte Cristo Sandwich is brunch’s version of a ham and cheese sandwich. 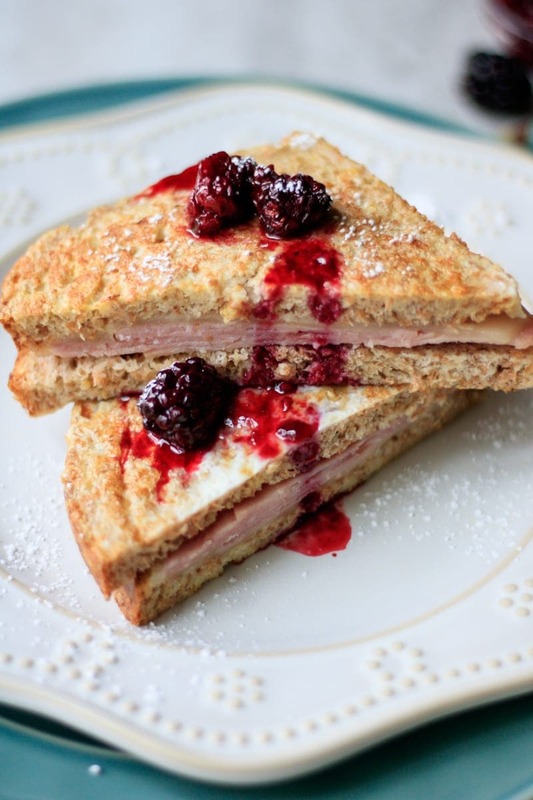 This recipe for Monte Cristo is served with a fresh blackberry syrup for one sandwich you will never forget! I fell in love with Monte Cristo Sandwiches at a tea house in Atlanta years ago. I was craving something hearty, savory, but a bit sweet and a Monte Cristo perfectly fit that craving. Monte Cristo sandwiches are ham and cheese sandwiches that have been coated in an egg custard and pan fried. Basically, a Monte Cristo is like a breakfast grilled cheese. Made with sliced ham, Swiss cheese and a slightly sweet egg custard, this sandwich hits both the savory and sweet notes you crave in a hearty breakfast sandwich. Traditionally, a Monte Cristo is paired with jam, but a fresh sauce made with blackberries turned this Monte Cristo into something quite spectacular. Spread 4 slices of bread with Dijon mustard. Layer with the ham and cheese, dividing ham and cheese evenly. Top with another slice of bread, making four sandwiches. Whisk together eggs, milk, salt, nutmeg and remaining maple syrup. Dip each sandwich into egg mixture, flipping to coat both sides of the sandwich. Heat butter in large non-stick skillet over medium heat. Place each sandwich in melted butter in skillet, and pan fry on each side until golden–about 5 minutes per side. Combine berries, 1 tablespoon maple syrup, and lemon juice in small sauce pan. Let simmer until berries only begin to slightly break down, only about 5 minutes. Place one sandwich on a serving plate, dust with powdered sugar, if using. Divide the blackberry sauce evenly between the sandwiches. I used whole wheat bread, but white bread will work as well for Monte Cristos. Be sure bread is sliced evenly and each slice is not more than 1/2 inch thick. Mustard is optional, but adds just the right amount of tang to the Monte Cristo. If you do not want to make blackberry sauce, serve Monte Cristos with jam or maple syrup. 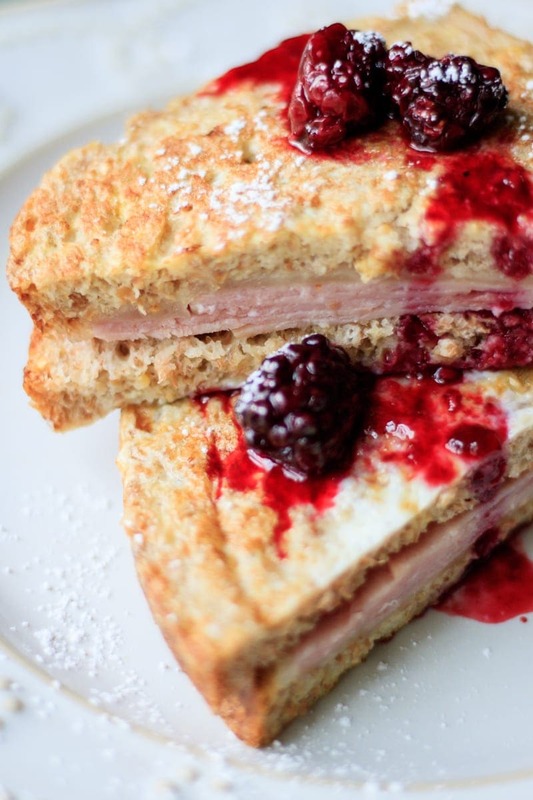 Monte Cristo Sandwich is brunch's version of a ham and cheese sandwich. 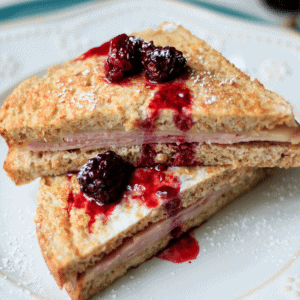 This recipe for Monte Cristo is served with a fresh blackberry syrup for one sandwich you will never forget! Combine berries, 1 tablespoon maple syrup, and lemon juice in small sauce pan. Bring to a boil and reduce to simmer. Let simmer until berries only begin to slightly break down, only about 5 minutes. Spread 4 slices of bread with Dijon mustard. Layer the remaining 4 slices of bread with the ham and cheese, dividing ham and cheese evenly. Place slice of bread that has been spread with mustard on top of slice with ham and cheese--making four sandwiches. Whisk together eggs, milk, salt, nutmeg and remaining maple syrup. Dip each sandwich into egg mixture, flipping to coat on both sides of the sandwich. Place each sandwich in melted butter in skillet, and pan fry on each side until golden--about 5 minutes per side. To serve: Place one sandwich on a serving plate, dust with powdered sugar, if using. And divide the blackberry sauce evenly between the sandwiches. Monte Cristos are one of those things that I completely forget about until someone posts something like this, and then all I can do is think about them until I make one. I LOVE the addition of fresh blackberries! Thanks Renee!! I forget how much I love them too until I make one and then head over heels . 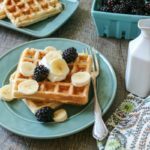 Loved seeing this recipe on Michelle’s page- I sent it to my mum to make for brunch next weekend. I agree–jalsberg cheese is a great cheese. 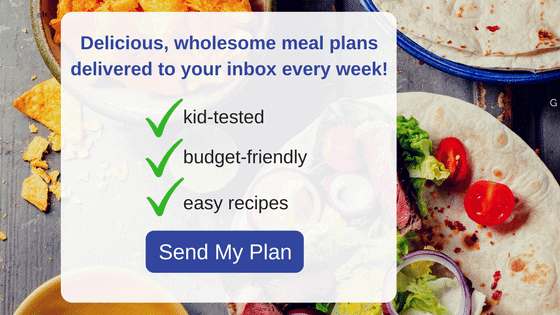 I bet your grandmother’s recipe is fabulous! I love, love a Monte Cristo! And even better with your fresh blackberry sauce!! Scrumptious!! The blackberry sauce is key to this! The Count of Monte Cristo is a movie. My mom really likes it, but I haven’t seen it. Monte Cristos really take grilled cheese to the next level! LOL!! I know my husband likes the movie too! I love me a monte cristo, but I’ve never had one with blackberry sauce. I bet it’s an amazing addition to this delicious classic. The blackberry sauce will really make you swoon Christie. I’m new to Montecristo sandwiches and I just love them. What a great idea with the blackberries! So glad you jumped on the Monte Cristo train! This sandwich is amazing and the directions were so clear! Thank you! 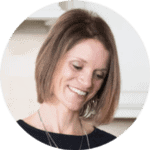 I am so glad you enjoyed Jennifer! This is one of our favorites! Nothing beats a good Monte Cristo sandwich in my book. This is one of the best!